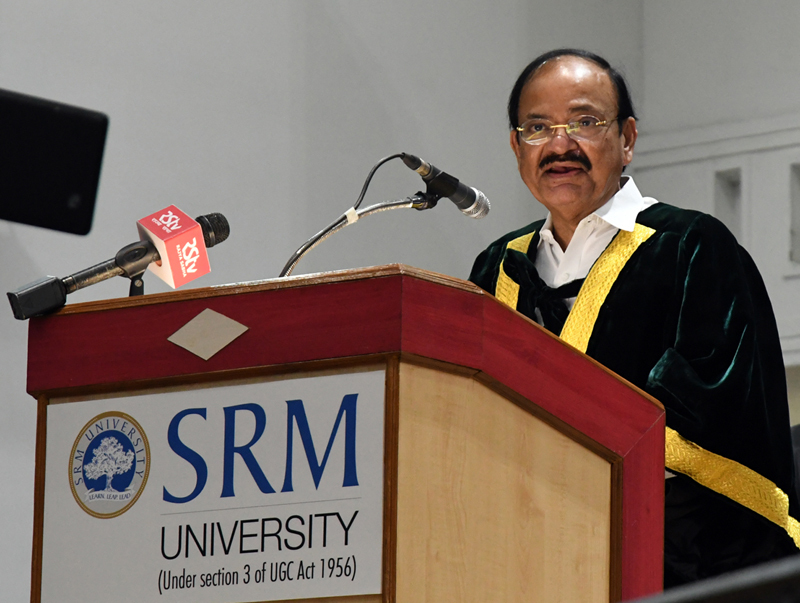 The Vice President, Shri M. Venkaiah Naidu addressing the Special Convocation 2017 of SRM University, in Chennai on November 23, 2017. 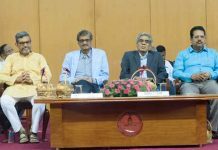 Chennai: The Vice President of India, Shri M. Venkaiah Naidu has said that character, caliber, capacity, conduct, compassion, hard work and discipline are important qualities for achieving success and realizing dreams. He was addressing the Special Convocation 2017 of SRM University, in Chennai, Tamil Nadu today. The Governor of Tamil Nadu, Shri Banwarilal Purohit, the Minister for Higher Education, Tamil Nadu, Shri K.P. Anbalagan and other dignitaries were present on the occasion. 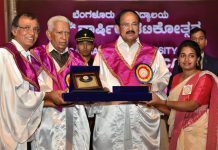 The Vice President said that the vision of higher education in India is to realize the country’s human resource potential to its fullest with equity and inclusion. H further said that this essentially means providing greater access to higher education for all sections, particularly the vulnerable sections of the society. Higher education in India is passing through a phase of unprecedented expansion, marked by an explosion in the volume of students, a substantial expansion in the number of institutions and a quantum jump in the level of public funding, he added. The Vice President said that education is the single most important element in converting our young population into national assets. If the younger generation of our nation is empowered, it will constitute a very strong and productive workforce for the coming years, he added. The Vice President said that India was once known as ‘Viswaguru’ and was the global center of learning as knowledge-seekers from all corners of the world used to come here and study at Takshashila, Nalanda and other centres of learning. The situation has changed following Mughal invasions and the British colonization and now the time has come for India to once again emerge as the global knowledge hub, he added. The Vice President quoted Mahatma Gandhi as saying “By education, I mean an all-round drawing of the best in child and man in body, mind and spirit”; “Education which does not mould character is absolutely worthless”. As the Mahatma had rightly emphasized character is the most important quality for an individual to chart out the right path, he added. “I congratulate all students who are receiving their degrees today as they prepare to enter a new world of opportunities and challenges. The vision of higher education in India is to realize the country’s human resource potential to its fullest with equity and inclusion. This essentially means providing greater access to higher education for all sections, particularly the vulnerable sections of the society. The Ministry of Human Resources Development on its part has come out with several schemes underscoring the importance of inclusive education. The budget outlay for higher education has been increased and the process of identifying universities as Centres of Excellence, which include many private universities, has begun. The Government is also keen on attracting the best talent for the teaching profession. 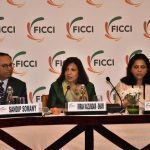 Higher education in India is passing through a phase of unprecedented expansion, marked by an explosion in the volume of students, a substantial expansion in the number of institutions and a quantum jump in the level of public funding. The enormity of the challenge of providing equal opportunities for quality higher education to ever-growing number of students is also a historic opportunity for correcting sectoral and social imbalances, reinvigorating institutions, creating new benchmarks of excellence and extending the frontiers of knowledge. Education is the single most important element in converting our young population into national assets. If the younger generation of our nation is empowered, it will constitute a very strong and productive workforce for the coming years. Today, multitasking has become an essential requirement at all levels in the job market. Ability to meet the competition and adapting to quick technological changes are the traits which are expected from every individual. We need to move to digital technologies and the universities have to change their delivery modes and adopt curricula which are relevant. The teachers have to update their knowledge and learn quickly about use of ICT in every respect. Thanks to technological advances and digital revolution, the world is changing at an unprecedented pace and the students coming out of institutes of higher learning must be equipped to deal with the emerging situations not only in terms of technical knowledge, but also in terms of analytical skills, critical thinking, creativity and innovative ideas. It must be remembered that universities are preparing students of tomorrow. Wherever necessary, traditional teaching methods have to be replaced with new ways of teaching as change is the only constant for progress in any field. In fact, the entire system from the manner in which students are taught to the conduct examinations has to be evaluated and overhauled. Classrooms should become exciting, interactive centres of learning for students and not teacher-centric sermon halls. Similarly, the time has come to examine whether memory-based examinations are serving any meaningful purpose. I would like every stakeholder involved in the education system– policy-makers, vice-chancellors, experts in pedagogy, lecturers and students—to come out with new ideas and suggestions for making the curricula relevant to the requirements of the digital age. India was once known as ‘Viswaguru’ and was the global center of learning as knowledge-seekers from all corners of the world used to come here and study at Takshashila, Nalanda and other centres of learning. Without dwelling on how the situation has changed following Mughal invasions and the British colonization, I would like to emphasize that the time has come for India to once again emerge as the global knowledge hub. For that to happen, the seats of learning, especially the universities must totally reorient their ways of teaching, functioning and equip the students to seamlessly transit into the choice of their profession or enable them to become self-employed. Sky is the limit for exploring various vocational opportunities and imparting the right education is the most critical aspect for the country to take full advantage of the demographic dividend. At times, I wonder if the modern education system in the quest for specialization is failing to produce a well-rounded personality rooted in strong morals. Is mere acquisition of knowledge to get a degree certificate enough? Obviously not, but that kind of attitude has been ingrained in the minds of parents and students and this has to change. We need to come out of such compartmentalized thinking. In fact, every student coming out of the portals of a higher educational institution should be like a Renaissance Man-somebody well-versed in different fields and adept at multi-skilling. “By education, I mean an all-round drawing of the best in child and man in body, mind and spirit”, said the Father of the Nation, Mahatma Gandhi. He also said: “Education which does not mould character is absolutely worthless”. As the Mahatma had rightly emphasized character is the most important quality for an individual to chart out the right path. Otherwise, despite having the privilege of getting educated in one of the best educational institutions, there is a danger of the individual going astray. The great Tamil poet and philosopher, Thiruvallur said: “An uneducated person is like a barren land. His life is empty and useless”. My dear young friends please remember that character, calibre, capacity, conduct, compassion, hard work and discipline are important qualities for achieving success and realizing your dreams. It is a momentous day in your lives and an occasion to plan your future. Never look at short cuts to achieve success. There is no instant success like instant coffee. Sincerity, patience, dedication and perseverance will ultimately lead to success. Dare to dream big as former President Dr. A.P.J. Abdul Kalam always used to exhort. There is nothing wrong in trying unchartered territories, but you must work with passion, unflagging determination, conviction and self-belief in achieving your goals. Friends, India is at the cusp of emerging as a major economic power. There are myriad opportunities and all of you must seize them and contribute towards the building of a new and resurgent India—an India which will be free of corruption, poverty, casteism, parochialism, religious fundamentalism and gender discrimination. 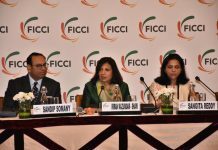 In this globalized knowledge-driven economy, India with its distinctly educated young population is at an advantage to take its pre-eminent in the comity of nations. Let us all strive to realize this goal. Research and innovations have become key parameters to judge the performance of a university. SRM University has carved out a name for itself among the private universities in India by providing quality education. I am told that the University offers scholarships worth more than 15 crore every year. 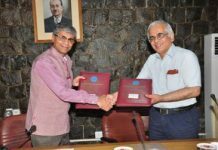 This speaks about the inclination of the university management to reach out to the academically brilliant and economically deprived sections of the society. I commend the Chancellor for his social vision and magnanimity. Dear students, this is a proud moment for all you having graduated from a university of repute and having learnt the skills required to meet the challenges that lie ahead. Your journey should not end by acquiring a degree and you must move forward to achieve big things in life. You are taking with you today not only knowledge but a series of additional skills which this institution has provided. As you move on, life holds lots of possibilities and opportunities. Both, knowledge and wisdom are important. One helps you make a living, the other helps you make a life.